In 2004, photog Gene Martin asked the guitarist/inventor who’d just received the Jazz Journalists Association’s “A Team” award for activists, advocates, altruists, aiders and abettors of jazz, to pose for a portrait. . .
For the past nine years I’ve done publicity for the Iridium Jazz Club where Les Paul performed every Monday. Gene Martin, who had already photographed many jazz and rock greats, wanted to do Les. He wasn’t interested in performance shots at the club. He wanted something special, something no one else had. Gene would call me and ask if he could go out to Les’s house in Mahwah, and if I could help arrange this. I told Gene Les is really private about his home. Many people have asked me do this so I knew the routine. However, I told Gene if he was willing to put in the legwork and come down to the club to schmooze up Les I’d make the introduction. Gene came every Monday for a couple of months staying for both sets and hanging with Les until the wee hours of the morning. Finally Les consented to let Gene come out to his house where he not only staged the famous ‘Tongue’ photo, but also took the most amazing photos of Les in his home I’ve ever seen. This is Les relaxed, surrounded by all his guitars and the famous multi-track tape recorders. Gene used color gels and special lighting to highlight these photos. The shoot was so successful that a major photography magazine did a feature story on Gene about the Les Paul photo shoot. As a result of this photo shoot Gene was hired to be the official photographer for Les Paul’s 90th Birthday concert at Carnegie Hall. As far as I know only three prints of the ‘Tongue’ photo exist all signed by Les and Gene. Les has one. One’s hanging in the Iridium and I have I one hanging in my office. Tragically Gene died returning from a photo shoot for an aspiring jazz vocalist couple year’s back. HM: Gene was the group-photo maker for the Jazz Journalists Association’s Jazz Awards for a couple of years at B.B. King’s, and also presented his photos to JJA members in meetings. Unfortunately, the state of preservation of his photo archives is unclear. 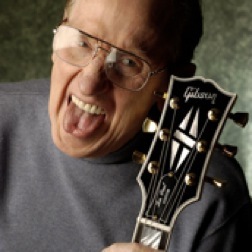 I think he would have been glad to have this photo of Les Paul on the web. As far as I know only three prints of the ‘Tongue’ photo exist all signed by Les and Gene. ??? ?